APCH/DEP SVC PRVDD BY HOUSTON ARTCC ON FREQS 126.35/338.25 (LACOMBE RCAG) WHEN APCH CTL CLSD. 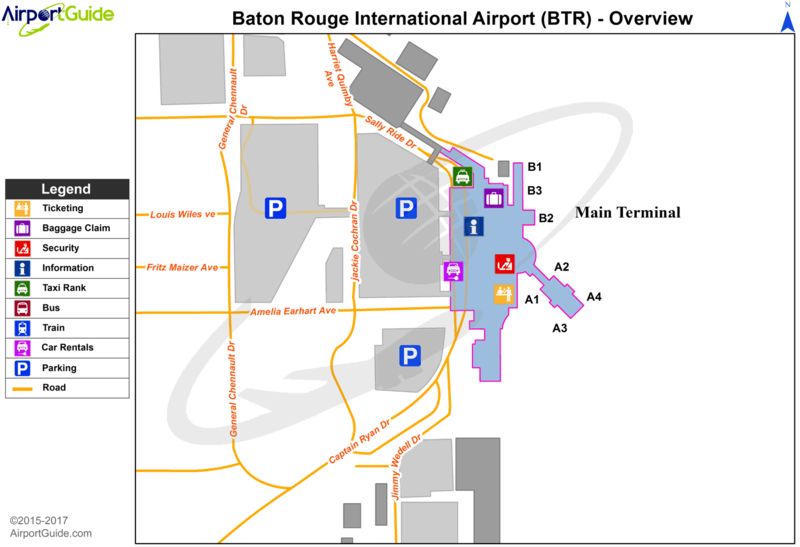 Capitol City Air Service, Inc.
A11 CITY OF BATON ROUGE AND PARISH OF EAST BATON ROUGE. A110-1 WHEN ATCT CLSD USE FREQ 121.9 TO CTC ARFF FOR EMERG REQ. A110-2 MIGRATORY BIRDS ON & INVOF ARPT DURING MONTHS OF MAR/APR/SEP & OCT.
A110-3 TWY M CLSD INDEFLY. A110-4 TWY E WEIGHT RESTRICTIONS: SINGLE 44,000 LBS; DUAL 55,000 LBS; DUAL TANDEM 93,000 LBS. 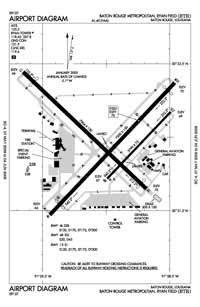 A110-5 RAMP & TWY LANE ADJ TO THE COMMERICAL AIR CARRIER TERMINAL BLDG IS LMTD TO COMMERICAL AIR CARRIER AND PSGR AIRTAXI ACFT ONLY. A110-8 RY 04R/22L NOT AVBL FOR ACR OPNS WITH MORE THAN 30 PSGR SEATS. A26 24 HRS PPR FOR UNSKED ACR OPNS WITH MORE THAN 30 PSGR SEATS 0000-0500 CALL AMGR 225-355-2068/0333. A30A-13 ARRESTING GEAR/SYSTEM: ENGINEERED MATERIALS ARRESTING SYSTEM (EMAS) 300 FT IN LENGTH BY 150 FT IN WIDTH LCTD AT THE DEPARTURE END OF RY 13. A57-22R +64 FT TREES 1598 FT 647 FT RIGHT, APCH RATIO 28:1 BASED ON DSPLCD THLD. A57-31 +68 FT TREE, 1578 FT, 516 RIGHT, APCH RATIO 24:1 BASED ON DSPLCD THLD. A58-13 +7 FT FENCE 200 FT 406 FT LEFT, APCH RATIO 0:1. A58-22R 10 FT ROAD 200 FT 474 FT L APCH RATIO 0:1. A58-31 +5 FT FENCE 200 FT 496 FT RIGHT, APCH RATIO 0:1. A81-APT ACTVT MALSR RYS 22R & 13, PAPI RY 04L AND MALS RY 31 - CTAF. WHEN ATCT CLSD HIRL RYS 13/31 & 04L/22R PRESET LOW INTST; TO INCR INTST ACTVT - CTAF. MIRL RY 04R/22L NOT AVBL. E60-13 ENGINEERED MATERIALS ARRESTING SYSTEM (EMAS) 300 FT IN LENGTH BY 150 FT IN WIDTH LCTD AT THE DEPARTURE END OF RY 13.